As part of our extensive batch of stainless steel wire rope products, this 6×36 construction rope with a 38mm diameter does more than just look good when combined with lifting gear. The 38mm 6×36 stainless steel wire rope offers a whole host of advantages that professionals in various industries will appreciate. Firstly, you need to know that this rope is available with one of a pair of potential cores onboard. With a load limit of 82,271kg, the independent steel wire core is clearly the winner in terms of strength. The 76,263kg capacity of the fibre core equivalent takes second place, but provides a more flexible base that should help lessen the signs of fatigue caused by rigorous use. Since this wire rope will not be inundated with rust spots after water exposure, it should facilitate safe lifting operations in all weather conditions and industries where outdoor use is inevitable. We offer made to measure wire rope of almost any conceivable configuration. 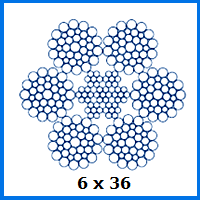 Take a look at our 18×7 stainless steel wire rope range, for example, or the super strong 1×19 arrangement. This is a small taster of what Rope Services Direct can manufacture for you. If you fancy taking on the task of adapting the rope yourself, our tools will let you achieve whatever you wish on-site after delivery. Emailing us is as simple as heading to our contact page and filling out the embedded form. If you would prefer to talk with an RSD representative on the phone, just call 01384 78004. 38mm 6x36 Stainless Steel Wire Rope Overall rating: 5 out of 5 based on 6 reviews.